The craftsmanship of the Evolv Shift can be seen in ever y detail. From efficient space utilization to innovative features, the Shif t delivers a compact housing that packs plenty o f power. Every aspect of the Shif t has been thoughtfully designed to be intuitive, clean and accessible. 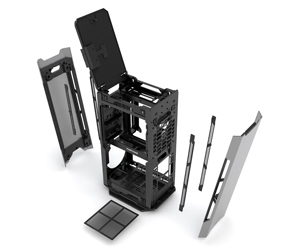 The interior is designed to meet the demand of AIO water cooling. Due to its small footprint and versatile placement, the Shif t will look impressive anywhere in your home environment or office space. * For dual aio setup: max 120x27mm radiators. * Depending on GPU height/length. 18.50" x 6.70" x 10.80"
Other Thoughts: building a pc with this case is a matter of patience, a quality case with front oan rear covers in aluminum and the last but not least came with a "premium cable riser" pci 3.0 ! - Nice case for RGB setup. Cons: - Wiring is a pain. Looping the wires from the bottom out to the left side just to come back into the middle and to wherever you want the wires to be. And make it all look organized is a pain. - This case is NOT ideal for overclocking. The disadvantage of this case is air control. Even with positive pressure and negative pressure setup, it's nearly impossible to have a stable system. There is no proper airflow throughout the case because of the middle plate where the wires are tucked right below the motherboard. It acts as a restriction to airflow if you were to intake air in from the bottom or from the top. On top of that, using any of the fans as an exhaust is not ideal at all because the given amount of space between the side plate cover and the fans, you will definitely have a lot of exhaust heat blow back against the fan. Which will build up inside your case over time. The side plate cover gets really hot as well since it's metal. Even mounting an exhaust fan you will have blow back exhaust due to filter and no room for air to disperse. Other Thoughts: - I am definitely going to stick to a more traditional case due to air control issues for overclocking. Possibly the NZXT H200i or Fractal Design Nano S.
Pros: Beautiful design. Unique. Conversation piece. Some interesting features, and a unique use of space. Could make a good HTPC/ workstation for light use. Very small footprint in vertical orientation. 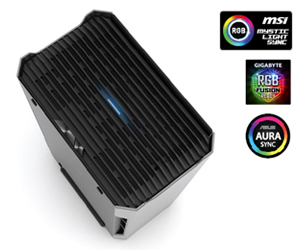 Nicely shows off those RGB components that you spent a fortune on. Cons: - Will roast your components. - Very few cooling options, none of which are viable for even moderate 1080p gaming. - GPU's thermals will be through the roof. - Some build quality concerns: lot's of creaking/popping/cracking sounds (I understand that some of this is inevitable due to contraction/expansion resulting from deltas in temps.) But much of the cracking/popping comes from the cheap plastic base/feet and the way that it affixes to the case. Other Thoughts: I really wanted to like this case. There truly is nothing on the market like it. I was perhaps naive in going into my build in assuming that I could pack mid-level gaming components in a case with such unorthodox and limited cooling options, and all would be fine. To start, with your cpu cooler you are quite limited in your mounting depth. This rules out many of the higher performance air coolers. Many of the compatible air coolers that will fit, will be exhausting hot air right up against the front glass (you will have about an inch of clearance.) 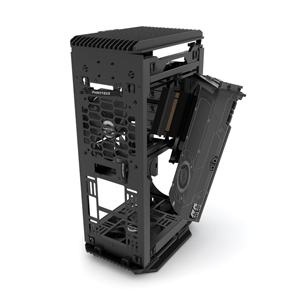 This air will eventually be exhausted out through your side mounted case fan, or rise up through the top of the case. In either case, don't expect an efficient evacuation of hot air from your case. The other option is an AIO, which you are limited to a 120mm rad. If you intend to run a full length GPU, that rad will have to be placed on the bottom of the case, so you are left with the option of exhausting air through the bottom, or pushing it back up through the case. (which I would advise against.) You could, however,, run two 120mm fans in push pull as the case allows you to discretely mount a fan in the bottom of it. I went with a Deepcool Captain 120 for an AIO because the general aesthetic seemed to fit my design. Overall I haven't had many problems with cpu cooling and it has generally done a good job of cooling my Ryzen 5 1600x. I do have to mention that the glass tube on the Deepcool Captain protrudes probably 2mm too far out, and it pushes the front panel out slightly, not enough to prevent the panel from going on securely though. I would consider any other AIO with a more flat block/pump. The GPU is another story. I am running a Sapphire RX 580 Nitro+. Now I realize that AMD cards are prone to running hotter, and maybe my results would have been different with one of Nvidia's offerings. First of all, with the vertical GPU mount and provided PCIe riser cable/bracket the graphics card pretty much has to be mounted with the fans facing inwards. This means that the exhaust air from the spu is just being pushed right up against the back of the VRMs with very little clearance. Again, this heat will eventually find its way out of the case, but not after making your components nice and toasty. Despite customizing fan curves with Wattman, and having the whole thing sound like an Apache attack chopper, I am still getting extremely high temperatures of 85 degrees Celcius on the GPU (heating up everything else as well.) I am currently having serious stability problems which I have isolated as likely being thermal. Random shutdowns in game (no BSOD). Crackling and cutting out audio, etc. I have attempted every other fix, with no avail. If these issues turn out to not be related to thermals, I will amend this review. I briefly entertained the idea of a custom loop, as there are a few examples of these cases with a custom loop floating around the web, but in this case, it seems like a frivolous waste. You would be limited to 120mm radiators, with very little thickness. Bottom line is that a computer has to do much more than look pretty. You may be initially enamored with this case's appearance, but if you are looking at doing even moderate gaming at 1080p I would strongly advise against this. There are SO many better options in the ITX category. Yes some of them are almost as big as some mATX cases, but your components will thank you in the long run for keeping them cool, and running quite. The Shift X may be another story. Although I can see the only way in making those GPU temps manageable would be to do a custom loop or hybrid VGA or AIO bracket. In the end, I went into this build extremely naive and I have learned a lot. I am not ready to give up on SFF computers and am currently waiting for the arrival of an NCase M1 (which I highly recomend.) 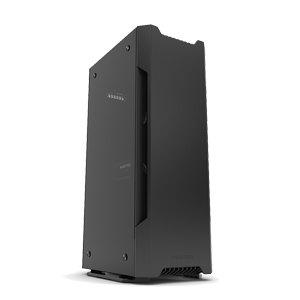 It is VERY expensive, but it truly is the no compromises ITX enclosure. If that is out of your price range and you need that TG side panel I would strongly suggest the NZXT H200, Fractal Nano S, or the Evolv shift itx/ Evolv shift X. Other Thoughts: i needed a small tower that would fit my small desk, and get my pc off the floor. as well, i wanted it to be stylish as it would be directly visible sitting atop of my desk; this fit the bill. if you care about cable management and the aesthetics, this case will test your patience. i built this over a long weekend and spent 2-3 hrs a day building and thinking about how to layout the cables. the case has a surprising amount of room to utilize. i have a commander pro and a lighting node, which i was able to hide by stuffing them into a side panel. it really is a unique design and does look stunning once it is finished. it is more or less an example of form over function though. if you are overclocking or are overly concerned about your thermals, i would avoid this case. The top portion of the case (the motherboard IO) isn't adequately spaced to completely close for many cable types. 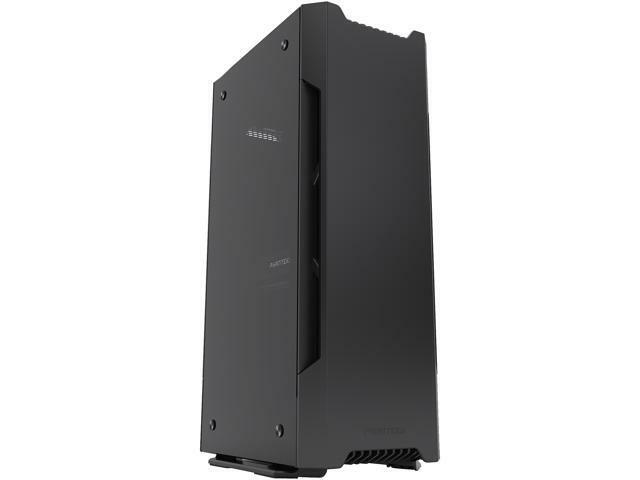 Other Thoughts: ASRock Fatal1ty AB350 Gaming-ITX/ac only support PCIE Gen1 or Gen3. This resulted in me forcing my 1070 to Gen1 speeds for this riser cable. Cons: Only downside I can think of is, SFX power supply is a must for this case. Other Thoughts: Got this on Newegg's eBay site. No problems with shipping. Other Thoughts: The case looks great and had plenty of room for water cooling which was the reason I got it for my itx build. The case is very easy to build in if you take your time and plan it out. Do not plan on putting an SFX-L PSU in it because it will not fit. Pros: This is a really pretty case made of excellent materials. Once you have it set up and you've spent the time on your cable management it's a lovely thing to admire, especially if you light it up. I was able to put a very thick H80i V2 radiator in the bottom of this case with a very long Strix video card, I had to forego the second fan on though. That's still a pretty good fit for a pretty compact case. Cable management with the little bridge in the middle of the case is pretty easy, and wiring up the 2.5" SSDs with no visible cables is a breeze. It's actually very good for a case that really doesn't allow you to hide most of your mobo cables. Cons: Just about everything in this case is a tight fit, like, really tight. The top 140mm fan is right against the motherboard, to the point that you have to restrain cables on most ITX mobos to keep them out of the fan. Do not use an SFX-L power supply, it will fit TECHNICALLY, but the cables will be painfully mushed against the cable-routing bridge in the center of the case. Stick with SFX only. Like many Phanteks products, this case is not the best when it comes to air flow. It's not terrible, but this is not your 14 fan full tower. Doing this case justice and putting RGB lighting in it will make you feel dirty at first. You'll get over it when you're done. Other Thoughts: When you build a Small Form Factor PC that's actually small you need to expect to suffer a little. You need to expect to cut a little metal, a little plastic, and donate a little blood and skin to the cause. This case required no choppy-choppy, it did demand a blood sacrifice from my right ring finger though.